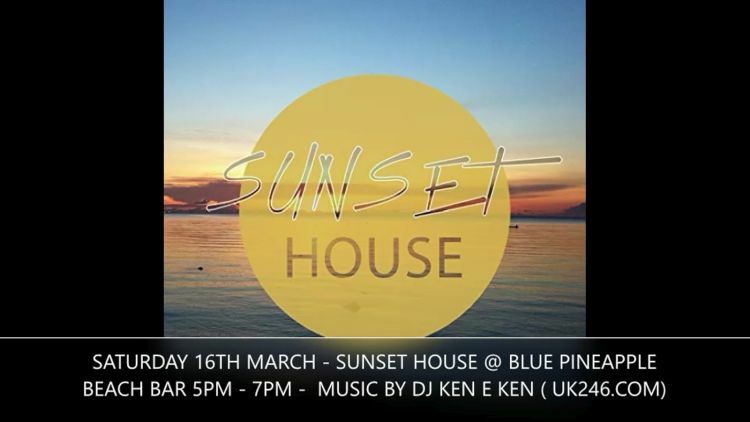 Blue Pineapple Beach Bar invites to Sunset House - a beautiful late afternoon/early evening Ibiza-style musical chill-out. Enjoy the wonderful beach, sea and sunset views whilst indulging in a full delicious Global/Local-themed food menu and sipping on a wide range of drinks served by the waitress to your table from the fully stocked premium drinks bar. Music by DJ Ken-E -Ken, playing a unique mix and blend of Soca anthems fused with US/UK Soulful beat and Latin/African Funky House.